Our latest EL Light Wire! The Elite Wire has 2 flash speeds and steady on modes.�It�comes in�10 colors. 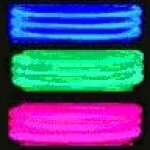 Elite EL Light Wire emits a spectacular uniform light source. Each Elite Wire has 3 selectable modes: steady-on, slow flash, and fast flash. (FYI- even the slow flash blinks at a faster rate than our original 2.1 ft Technoflash Wire's blink mode.) Comes in your choice of ORANGE, or PINK, wire. For an additional charge of $4.20 per unit, the wire can be upgraded to the brighter 2.6mm Polar Bright 3 wire in the following colors: BLUE, BLUE-GREEN, 0RANGE, PINK or YELLOW.